This Yamaha YFZ450 has plenty of giddy-up to go racing. When the world of ATVs (All-Terrain Vehicles) began to sprout up and dealerships everywhere began selling these off-road machines, performance modifications also began to grow right along with them. As with any recreational machine, whether on or off-road, there will be many who want a little more than the typical performance. Getting more power and bigger displacement is always going to be a factor, and with the latest in turbo-boosted, side-by-side, off-road vehicles it has become an income-generating proposition for any who wish to add to their shop’s offerings. 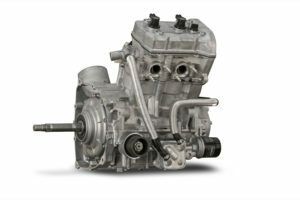 Most may consider the world of ATV to have very small engines that produce little power – and even less income potential for the local engine building shop. This could not be further from the truth as many engines, even those dating back to the late ’80s, have since become staples in ultra-high performing power plants. The mid- to late-’80s Honda TRX250R was a perfect example of one such mill that even in its two-stroke form gave many small engine builders years of income in performance modifications. It also still outperformed most of the “next generation” four-stroke machines that would line up next to it into the early 2000s. As the prosperous years began to bring even more development in the world of ATV, the big companies in this industry started looking at building a better performing side-by-side (SXS) vehicle. Most would use the term “Golf Cart on Steroids,” which was actually despised by most manufacturers – yet some of those first machines (John Deere Gator and Kawasaki Mule) were not much bigger than a large golf cart. The 2004 model year Yamaha Rhino, however, seemed to be a turning point for the SXS industry and brought with it a 660cc gas burning mill that became the newest performer for enthusiasts everywhere. Adding larger displacement cylinders and pistons as well as performance profile cams and stroked cranks just seemed to liven the engine up and businesses once again had something new to offer their customers. Even though it was a single cylinder it held a position of growth for shops who would focus on it. This was a first for our industry and it was certainly not to be the last time Yamaha would make a stand in the off-road world. This Suzuki ATV engine is in the shop for top end service. Many ATV/UTV and SXS owners would gladly bring in their engines for professional service versus trying to do it themselves. The Bombardier-owned Rotax engine is also no stranger to recreational vehicles, both on or off-road as well as water – the personal watercraft (PWC) world knew this mill for many years before we began to see it hit the dirt. High performance watercraft engines including Sea-Doo’s twin-cylinder, inline, two-stroke power plant gave shops all over the nation something to build upon, quite literally. In fact, the world of horsepower on water seemed to be cornered at times with this engine. Having personally owned a 1997 Sea-Doo Xp powered by the 797cc two-stroke mill, I can attest to its power hidden within just waiting for someone to build upon it. There are companies offering aftermarket parts for many of the PWC engines and most can be installed by consumers, but most enthusiasts still prefer a shop do the work to ensure the longevity of the motor. In 1998, the Bombardier Traxter ATV was introduced and then the DS650 sport ATV followed soon after, both powered by the Rotax engine. The Rotax single-cylinder mill was opened up by many machine shops, and as the popularity of this engine exploded, the development did as well. There is plenty of room in the case of this engine for greater performance. It would be my first brush as a racer with an incredible amount of torque and brute four-stroke horsepower. If you look at the family tree of Bombardier engines you will notice that in the model year 2007 the brand was reborn, taking back its 1970s racing heritage namesake “Can-Am.” It was in the next few years that I myself discovered some performance advantages to the Rotax twin-cylinder engine. 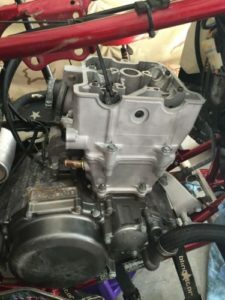 Many racers and shops soon figured out that the bottom-end of the Rotax twin-cylinder was the same, whether it was the 500cc, 650cc or 800cc engine. This allowed creative builders to swap parts around and make high power gains with more available parts. Starting with a 2006 Can-Am Outlander 650 we created an 800cc engine simply by swapping the top end components. We then added in camshafts that had been developed by national ATV champion Mike Penland and tuned the fuel map to get our final gains. This Yamaha YXZ1000R is a triple-cylinder engine that can reach a 10,500 rpm redline. It would not be long before innovative engine builders began developing large cylinders and higher strength rotating systems to handle the added displacement. There was definitely money to be made in these motors. In model year 2011, Can-Am would jump into the SXS world with its V-Twin, Rotax-powered Commander and again, engine builders found a small fortune in producing power from these mills. If you look at Can-Am today, you will find the Maverick X3 turbo-powered SXS that is very much in the mix of top-performing machines with 172hp! 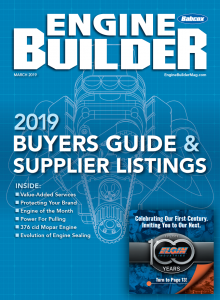 When we began to see the big V-Twin engines sprouting from companies like Kawasaki, it was even more apparent to many mechanics that this signaled additional income opportunities. The Kawasaki Prairie and Brute Force ATVs have won several championships both in national racing events as well as in the Baja 1000 with wildly modified engines. This V-Twin platform is easily tweaked with head work as well as cam and fueling modifications. Performance cams may be the simplest bolt-on part and with a little jetting and air intake tuning combined with a tuned aftermarket exhaust the engine could gain 15-25 percent or more usable power. Fast forward to the latest years of the Polaris RZR (first introduced to the public in 2007) and you now find an inline, twin-cylinder mill that produces incredible power. In fact, the advent of Polaris’s Pro Star engine in the RZR line began a horsepower war like none before. It was all other manufacturers could do to keep up with the claims that Polaris had been making in their spec sheets not to mention the new segment of sport recreational vehicles they had created. The 570, 850 and 1,000-sized Pro Star engines have been making big horsepower with add-on parts as well as straight out of the box, but in the past few years the turbo engines have seemed to be the craze. This is a Yamaha Wolverine X4 engine. Adding larger displacement cylinders and pistons as well as performance profile cams and stroked cranks livened engines like this up and businesses once again had something new to offer customers. These single as well as twin and triple-cylinder, inline engines began producing power never before experienced in the ATV/SXS industry. In addition, the rpm range began to increase as some triple-cylinder engines like Yamaha’s YXZ1000R can now reach a staggering 10,500 rpm redline before the limiter gets involved. In the current model year, we have seen many companies starting to add turbos to their inline, multi-cylinder power plants – of course, new ideas, new issues. The need for stronger rotating assemblies require shops to replace the connecting rods and strengthen the overall power plant to accommodate the pressures within. Companies like Rotax are building their own turbos while others rely on current proven development from companies like Garrett to provide a suitable product. 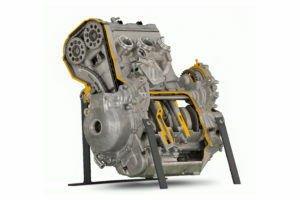 These engines are derived from the snowmobile power plants in their own manufacturer’s family of off-road vehicles and are now being adapted to run in the SXS vehicles. We know that snowmobile power is incredible with huge horsepower claims, and as our industry grows, this borrowed technology will increase. So, what does all of this history and documented growth over the last 20 years mean to the shop owner? It is no secret that opening up an engine – big or small – has its advantages and disadvantages from a profit standpoint. 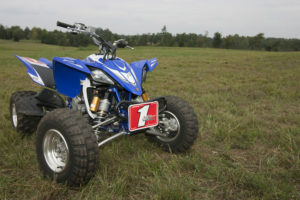 How each shop approaches this world of off-road is completely up to their own knowledge and tooling limitations, but with the advances and popularity gain in outdoor recreation vehicles, the world of the high performance ATVs is wide open. Whether you begin with simple engine rebuilding efforts or look deeper into the aftermarket world of bolt-on power, the industry of ATV/SXS will most definitely add to your bottom line. The years past and present, as well as our view of the future, indicate plenty of room for profit in the new era of off-road power. Raised in the racing communities around rural North Georgia, Rick Sosebee is an off-road powersports journalist who loves stretching the bounds of modern ATV/UTV engines. He also loves wrenching on his Chevy Duramax 2500HD as well as his father’s old 1971 Corvette.